From left, Edward Nuñez, Pamela Thornton, Somalid Hogan, and Jack Toner say the YPS is striving to redefine what it is and what it can do best. 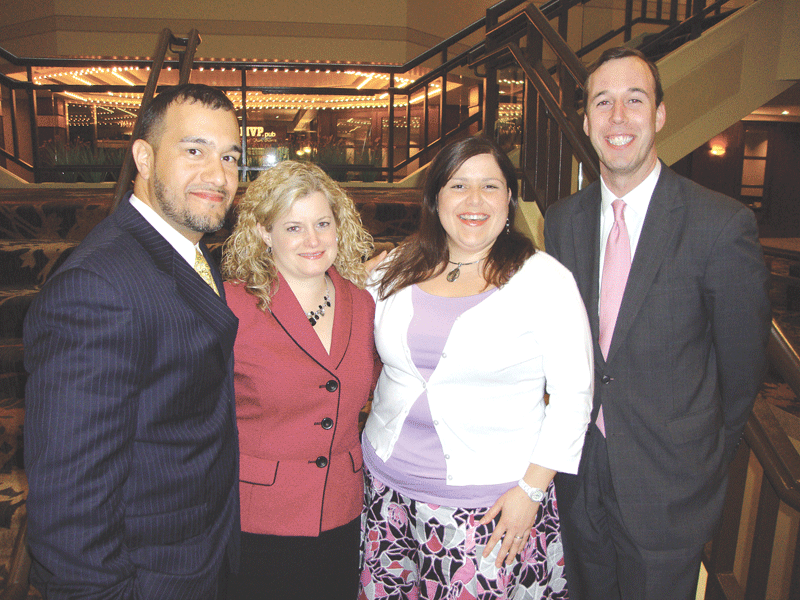 On a night in early April, the Springfield Leadership Institute, a program created through a partnership between the city’s chamber of commerce and Western New England University, held its 2012 graduation ceremonies at the Sheraton in Monarch Place. Offering guidance, support, and the tools for members of the business community to become regional leaders, the institute’s proceedings had very special significance for several members in attendance. 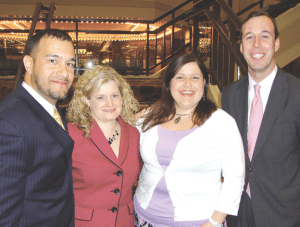 Presenting their own organization’s annual award were several members of the leadership team and board of directors from the Young Professional Society of Greater Springfield (YPS). Four of those individuals talked with BusinessWest about how the origins of their organization could be traced back to a similar graduation ceremony five years earlier. “In 2006 there were five or six people that decided that this invigorating business course couldn’t stop here, and they decided to push forward,” said Pamela Thornton, current president of the YPS. Joining Thornton and Toner to discuss the past, present, and future of the YPS were Somalid Hogan and Edward Nuñez, both members of the board of directors. Nuñez (also profiled in this issue as a member of the 40 Under Forty), said that, while the group is perhaps best-known for one of its signature events, the so-called Third Thursday, an informal monthly gathering, YPS has long strived to go well beyond networking. And all agreed that the time for YPS to reinvent itself has come. Hogan said that there will always be plenty of social-networking opportunities for the group because this is a key component to their event schedule. But these inclusive and engaging events will strive for increased opportunities for professional development — an important suggestion from the surveyed members. But after five years, the YPSGS is getting down to business, and that means examining its strengths, points of focus, and long-term goals for the vitality of the organization. “Live, work, play, and stay” — that has been a familiar mantra since the early days of the YPS, Nuñez said. “We’ve been having a lot of discussion about the fact that we think of ourselves as young professionals,” he added, “but as a group, we also strive to get the word out that Springfield has a lot to offer — and we need to retain those young professionals. Get them to invest in the city and see what it has to offer. The business community certainly has been hearing those voices: Since the beginnings of the YPS, the membership has swelled to 500 active members, and there’s another tier of corporate membership for area businesses. Clearly, the YPS knows how to get things accomplished. Toner said the YPS is committed to challenging negative stereotypes that may pervade the business and social spheres of the Springfield area. To address the members’ political perspectives, the organization is hosting its third Vote the Valley event this fall to correspond with the national presidential election. Getting young people involved politically is just one of many accomplishments the YPS can claim beyond its monthly networking events. Indeed, the amount of charitable offerings and number of members on nonprofit boards of directors are both far too numerous to mention individually, but the four did count off some of their most recent beneficiaries — the United Way, Habitat for Humanity, and Keep Springfield Beautiful, among many others. Taking that opportunity to segue into the unfolding future of the organization, Toner added, “when we ask what kind of organization we want to be, that will still be our leading edge, but it’s also our hook. And in recent years, YPS members have clearly indicated that, while networking is an important aspect of the group’s mission, they want to take away something more. To that end, all agreed that an important component of their strategic planning involves increased opportunities for professional development. But the sky’s the limit, according to Toner, when it comes to other goals that the YPS wishes to pursue. “It’s a deeper commitment that we seek from our members,” he explained. “The first is an engaged membership to fill a lot of the programming needs. We always want to include everyone, but it’s almost like a triangle was flipped around, where the widest part of the triangle was at the top. We want to flip it around where the membership base feeds into the board. One of those things that the YPS will always do well is put like-minded people together, be it socially, professionally, or, as was mentioned, matrimonially. And an important part of that are the people themselves. “When you’re talking to a peer, you’re more likely to hear what that person has to say,” Thornton said. “We can share the YPS mission with other young professionals, coming from young professionals. From that there is good communication, there is good understanding, and it’s relative. It doesn’t mean that other economic organizations aren’t doing a good job, because they certainly are — a lot of them are thriving. But this is a great introduction for young professionals into something bigger, a great place to cut their teeth on a board of directors. “We’re the future leaders, but we have to start somewhere,” she continued. In the age of seemingly incessant Facebook newsfeeds, LinkedIn updates, e-mails, texts, or any other number of online reminders, nothing can yet compete with face-to-face interaction, said those we spoke with. That’s one signature experience that the YPS will always do very well.